There are many reasons people visit our premier dental clinics in Mexico. On occasion, emergency dental appointments are required if a tooth has chipped, a dental abscess develops or gums start bleeding excessively. Tooth cavities caused by decay in the tooth enamel are the most common dental problem. Dentists treat tooth cavities with dental fillings and dental hygienists will clean the teeth and gums to remove any surrounding decay to prevent further cavities. Gum disease can cause sore, bleeding gums and damage teeth, leading to tooth loss if untreated. Teeth can fall out because of decay, injury to the mouth, gum disease or may need to be removed to prevent further tooth decay or to make room in an overcrowded jaw. Dentists have a range of dental solutions to replace missing teeth from dental implants to dentures. Teeth that are broken or chipped are more sensitive and it is easier for tooth decay to develop in fractured tooth enamel. Correcting the chip or fracture is done using veneers, dental crowns or simple tooth bonding. Minor chips in teeth may not cause any dental harm but patients may want to repair the chips to improve the appearance of teeth. Tooth abscesses appear as a result of infection in the mouth or gum or as a result of severe tooth decay. 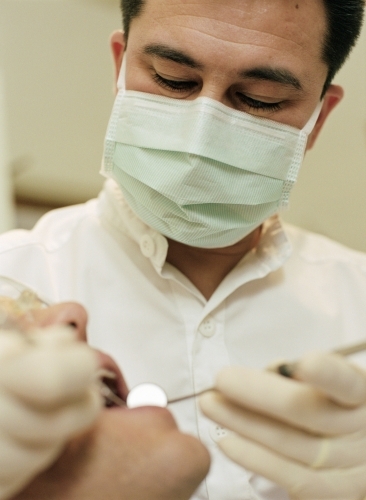 Dental abscesses are common in patients who require root canal treatment to repair deep tooth cavities. Stained teeth do not affect your oral health, however teeth that are discolored can affect the way you feel about your appearance. If the stain are superficial, a deep root scale and polish by dental hygienists may remove the stains and there will be no need for further dental treatment. If the stains are ingrained in teeth, tooth whitening options are available to restore the natural brightness of teeth, while crowns and veneers can be attached to stained teeth to restore damaged teeth and disguise the stains on teeth.